This book contains some of the most disgusting views and beliefs ever written down. 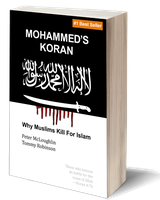 Unfortunately, it must include the Koran to both shine a light on the terrible book that it is, and to give non-muslims an easy way to navigate it, as it is in reverse chronological order. At first you might think that it would make more sense for it to be in usual chronological order, but it becomes clear when reading the book that it being reversed enables the reader to see just how much the book contradicts itself, especially when it comes to anything resembling a reasonable belief or command. The first half of the book, while less vulgar, is no less shocking. It shows how the public's opinion of Islam has been distorted to the point where even the president of the USA came out and called it a "religion of peace", and backs up its claims, which would be easily dismissed as conspiracy theories otherwise, with solid sources and research. Overall, this book doesn't exactly make for light reading, but I would still recommend it to anyone who has even a passing interest in the Islamic problem.